The David Jones runway show never fails to pull some incredible talent (think Victoria Lee, Jessica Gomes, and Karlie Kloss), and the SS18 collection was no different. 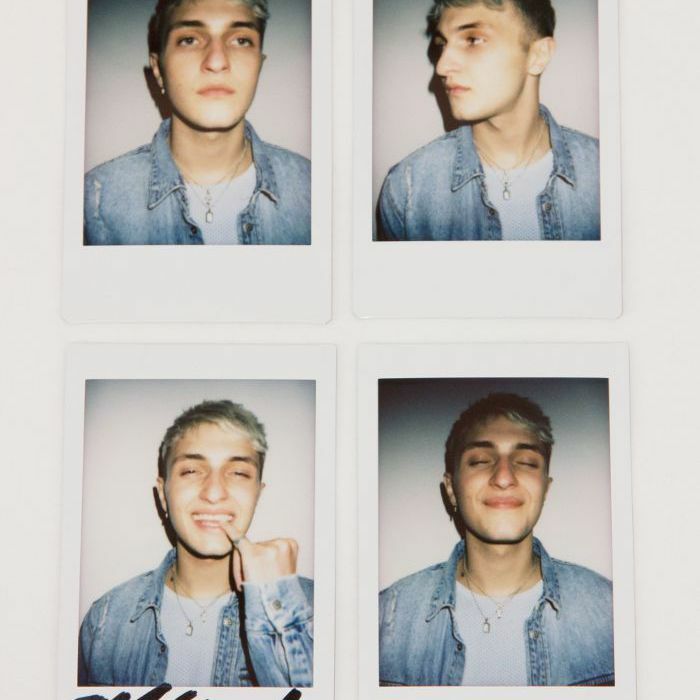 This year, the youngest of the Hadid clan (and brother to Gigi and Bella, for those just catching up), Anwar was part of the stellar lineup, and we were lucky enough to steal 20 minutes with the model backstage to pick his brain and take some Instax shots. Thoughtful, kind, and well beyond his years, the 19-year-old has a refreshing take on the modelling industry, his health, and staying grounded in a world that can be superficial, to say the least. Naturally, we also hit him up for his sister's skincare tricks, and praise be, he fessed up. For everything from his go-to television picks (eclectic), to bleaching his own hair with supplies from the drugstore, keep scrolling for the full interview. Growing up with lots of females around you, how has that influenced your approach to beauty and skincare? I’m probably more open to it all. I’ve definitely seen some crazy stuff that my mum and sisters have put on their faces. Have they taught you any tips or tricks at all? Yeah, my sister [Gigi] puts toothpaste on her pimples. It’s super weird. It works though, it dries them out. Do you use anything on your own skin, other than the toothpaste? No, I like to always wash my face, but all the face creams... I hate having stuff on my face. As a male in the modelling industry, do you ever feel like there is more or less pressure for you to look a certain way, as your sisters might feel? I personally don’t think there is any pressure. There might be pressure put on models by other people, but I don’t feel that. I don’t have anything to prove to anyone. Do you have a routine in the morning when you wake up? I'm so boring! I shower, brush my teeth, and try to do some push ups. I don't drink coffee—just water, and maybe some tea. I try to call my friends and have conversations with them in the mornings. We have good people around. Bouncing ideas off of people, it’s so fun, it’s expansive. You can cover so much in so little time when you're talking, rather than texting. And what about before bed? Again, boring. I watch television, and take a shower. How do you take time out and relax? My family have a farm. I just try to chill out there, get away from the world and be with nature. My mum cooks for my sisters and I. She's even got crystals everywhere. It's great. When I’m in LA, even just going to dinner with friends is a great way for me to step away from work and chill out. Are there any other things you do to look after your health, especially seeing as you have Lyme Disease? I just stay healthy. I take a lot of herbs and stuff and just try to keep my immune system in good shape. My mum has been great at educating me on that. I love to try natural supplements, but one thing I take consistently is green algae. I literally carry it around with me. Tell me about your hair. What made you decide to bleach it? I wanted to shave my head one day, and I told everyone I was going to shave my head and they were like "please don’t". So I said okay, I’m not going to shave my head! But I still went and had the top of my hair dyed. Basically after that, I cut it shorter, and went to CVS, and bought bleach. A friend and I bleached it. I bleached it again a few weeks later, and then dyed it blue. It's almost like the colour of an iceberg right now, ha! So you have a lot of incredible tattoos. Do you have plans for any more? I’m planning on getting one here [while in Australia]. I’m staying in Bondi, so I’ll probably get one around there somewhere. I'm not sure what it will be yet though. Do you plan them out? Or do you just decide spur of the moment? I’m the most random person. I’ll really just get a tattoo whenever I feel like it. But they do all have personal meanings to me. I’ve got one from the Bible that says, "No weapon formed against me shall prosper." That's an important verse to me. You often have your nails painted. How do you choose the colours? I don’t know. If I have colours, I like putting them on top of each other, making rainbows. There’s no plan when it comes to that! What’s inspiring you in life right now? Honestly, I’ve got a lot of friends around me right now that are coming to me with a lot of passion in their hearts, to speak on things that I think are really important. To me, that’s really inspiring. Basically, it’s just really exciting for me because all my best friends right now are just doing amazing things, not even on a business standpoint, but on a human standpoint. It’s just great to see people coming together on some good vibes and standing up to important issues. You have this incredible modelling career, and the industry is in quite a state of change at the moment. What are some changes you would love to see? I think diversity is the most important thing in the world, but also, I think it’s the most important in the modelling industry and fashion. I think we are doing a great job so far, but there is so much that should be done, and so many more amazing things that could happen and that’s just so exciting. Where do you see yourself in your career in the next few years? I just hope to be able to inspire people. I’m also dropping a clothing and jewellery line in the next two or three months, so I hope to be successful with that. From there, I would love to be able to use that platform to do a lot of things for human rights, and hopefully be able to collaborate with brands that donate proceeds to people in need. All photos were taken with the Fujifilm Instax Mini 9 ($88).